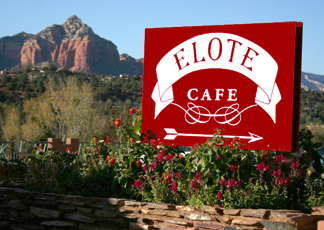 If I have a guest visiting and they are willing to drive a little bit for dinner, I try to take them to Elote Cafe in Sedona, which has rightfully earned the reputation of being one of the best restaurants in northern Arizona. Located at the Kings Ransom Sedona Hotel, you can tell that this used to be a much more modest restaurant until former Scottsdale star chef Jeff Smedstad decided to take root here. They emphatically do not take reservations: it's first come, first served, starting at 5 pm. During busy times, the wait can be 2 hours, but on weekdays, I have usually waited 30 minutes to an hour. While you wait, you can get a margarita or other libation, munch on their tasty spiced popcorn, and look out over the beautiful pool, if the weather is nice. Be patient, and you will be rewarded.